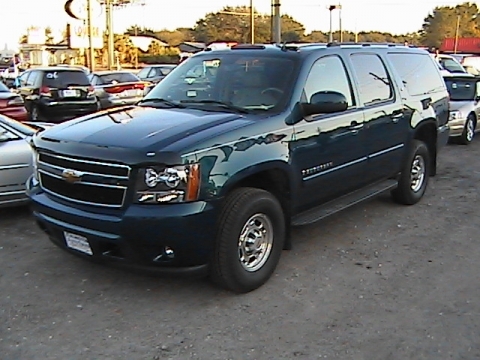 Description: 2007 Chevrolet SUBURBAN 3/4 Ton-V8 Utility K2500 LT. 6.0 Vortec V8. 245k actual miles. Goes up every week. (4 Wheel Drive). New Motor and Transmission installed within last 6 months (Got all the receipts)(30k or less on new motor. Very well maintained. This vehicle has all the options. No Sunroof. ONSTAR but no navigation system. Color is Bermuda Blue Metalic with Light Charcoal Interior. 6.0L V8. Daily driver for owner of our dealership. New Michellin Tires (all 4). Towing package. Leather Seats. For more info call John at Arlington Auto Sales 904-724-0444. Also visit our website at www.arlingtonautosales.com to view the rest of our inventory. Price does not include $199 dealer fee or appropriate sales tax for your area. TAG is COD. VIN#3GNGK26K17G193639, STK#193639. ***FINANCING NOT AVAILABLE ON THIS VEHICLE. MUST EITHER PAY CASH OR OBTAIN OWN FINANCING.